Most people are aware of the God of Thunder from Norse mythology as Thor. Most people probably also know that he appears in the Avenger movies. They probably are aware that he has this hammer, Mjölnir, that he uses to pummel his enemies and defend Asgard and the people of the earth, in his role as a God and an Avenger. What they probably do not know is that in his down time from fighting and avenging and being the God of Thunder he has another hammer that he uses to make small bird houses. It’s one of those things most people, and even some of the Gods in Asgard, don’t know about him. He has this sensitive side that never gets depicted. It's always fight this, avenge that. 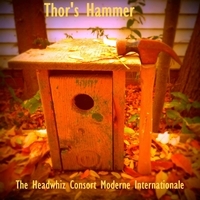 Well this piece of music is dedicated to both the powerful fighter of Norse and Marvel legends (the beginning part) but also to the side of Thor that uses that other hammer (see picture) to create homes for his avian friends (the ending part) . It also features some hellacious drumming by Hans Z and the first appearance of the Mind Fry Orchestra led by conductor Raul Espinoza!